Usually, I write a meta report at the end of each month, but almost nothing changed in the past seasons because the GOATS team composition is still dominating the higher tiers of the matchmaking. If you want to learn more about this strategy, I talked about the GOATS gameplay, pros, cons, and counters in the season 12 report. The table is responsive. If you are using a phone, turn it sideways for a full view. Otherwise, zoom in or click the grey area to swipe it. The most played heroes at GrandMaster in November and January are exactly the same; just their position in the top 10 is slightly different. The game might change drastically in February because the current PTR patch will make it to the live client. This update has been thought to fight versus the deathball compositions with several tanks as armor received a substantial nerf. The damage reduction from armor has been decreased from -5 to -3. According to the developers, this adjustment will be of great help to DPS heroes who fire quickly or in burst of shots (such as shotgun users). We don’t know exactly how this patch will affect the meta at each rank, and if it will be enough to deal completely with GOATS, but surely February will bring many changes to the most picked heroes both in pub and pro games. This update is so decisive for the incoming meta that Nate Nanzer, Overwatch League commissioner, already announced that the first stage of OWL 2019 Season will be played on the patch currently on the PTR. The new patch made it to the Live Client on January 24th, with the release of the Lunar New Year 2019 - Year of the Pig. All the stats displayed in this article have been gathered a few hours before its release. I don’t want to shatter your dreams, but the nerf to armor is very overrated. Pro players have been practicing this patch on the PTR client, and after reading their comments I expect GOATS to remain the most popular team composition in over 50% of the games, both in high ranked and competitive games. I decided to not talk again about the current meta, instead I want to focus your attention on the latest addition to the Overwatch roster: Ashe. Currently, she enjoys a respectable pick rate at all ranks, so I hope you will find useful the following details and tips about her gameplay! The robotic butler jumps in the middle of the fight, creates chaos, tanks a lot of damage (1,200 health points), and automatically attacks the enemies in range. At most ranks, BOB can change the fate of a team fight because many players don’t know how to react against him. BOB is treated as a player, so he can be healed, buffed (Nano Boost drammatically increases his toughness and damage output), but also affected by crowd control abilities. Hack is one of the best counters as BOB will be inactive for 6 seconds (the ultimate has a total duration of 8 seconds). Sleep Dart is also very efficient if your teammates won’t wake him up instantly. Stuns work, but generally they do not last long enough. Depending on the map and his placement, Lucio can knock back him into an useless spot, while Reinhardt can just charge him away from his team. If you do not have a proper disable at your disposal, there are only two options left: hiding while BOB is on the field, or killing him. The robot has a massive body so it is very easy to hit him; you should try to headshot him as much as possible. If the entire team focus fire him, he won’t last for long. Note that damaging, killing, or healing BOB doesn’t provide any ultimate charge. The table below shows Ashe’s damage falloff. Damage falloff: the farther a target is placed, the less damage you will deal. Hip fire: shooting without aiming down the sights. ADS: it stands for aiming down sights, the opposite of hip fire. Ashe’s optimal sniping range is below 40 meters, which is equal to the distance from the statue on the first point of King’s Row to the attackers’ spawn. Honestly, this is a quite long distance so in most scenarios you will be able to use her in sniper mode, but I still believe it is important to point out that the hero is a sort of hybrid, while some players think she is just a sniper like Widowmaker. Ashe is a very flexible hitscan hero who fits well in a medium to far range: the same area covered by Soldier: 76. On the other hand, Dynamite brings a lot of value, and you need to stay closer to the front line to take advantage of this ability. McCree is one of the best anti-flankers in the game thanks to the stun provided by Flashbang. Soldier: 76 can just sprint away and heal himself with Biotic Field. Ashe has some mobility via Coach Gun, but this disengaging tool is not enough for a reliable escape. It is not a secret that most Overwatch characters have a big head hitbox. Blizzard gave the same treatment to Ashe. The following video shows her hitbox frontally and laterally. This is not a bug, but just a tool the developers can use for balancing reasons. Another great example is Zenyatta, which head headbox is really massive. With some legendary skins (such as Djinnyatta and Ifrit) that area is covered with a turban, but it looks really odd on the standard skins. The Overwatch Ranked Tier List indicates the most popular heroes during season 12. 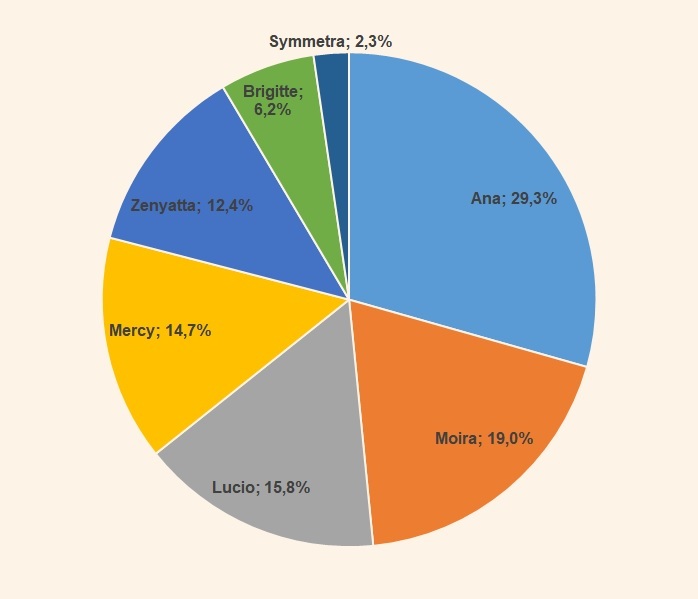 Find out the most successful heroes in this meta depending on your rank.